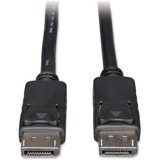 Keyspan Mini DisplayPort to DisplayPort Adapter-4K x 2K @ 60 Hz, Keyspan, Black, 6 in. This Keyspan® Mini DisplayPort to DisplayPort cable plugs into the mDP or Thunderbolt 1 or 2 port on your tablet, laptop, Chromebook, MacBook, smartphone or PC. 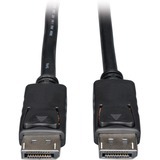 By connecting the other end to the DisplayPort cable leading to the DisplayPort input on your monitor, projector or television, you can transmit mDP audio and video without the expense of buying a new mDP display. This Mini DisplayPort adapter is ideal for transmitting digital audio and 4K video to a large display, such as an HDTV or digital sign. The six-inch cable supports Ultra High Definition video resolutions up to 3840 x 2160 (4K x 2K) at 60 Hz. Molded nickel-plated connectors with corrosion-resistant gold-plated contacts provide maximum conductivity and minimum data loss to guarantee a clear transmission free of interference. Foil and braid shielding delivers reliable, error-free signal quality and protection from EMI/RFI line noise that can distort or destroy data. Integral strain relief gives the cable extra flexibility, reduces stress, and helps the cable and connectors move freely without cracking. 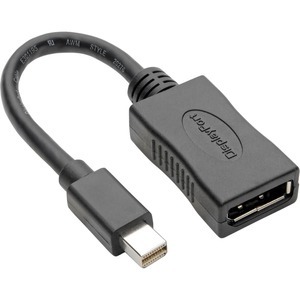 The plug-and-play Mini DisplayPort to DisplayPort cable requires no software, drivers or external power. The compact six-inch unit fits easily into a pocket, briefcase or laptop bag for connecting on the go. The P139-06N-DP4K6B comes with a lifetime warranty. It's manufactured in compliance with strict RoHS specifications, reflecting Tripp Lite's commitment to environmental responsibility. 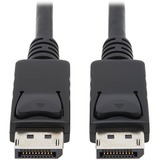 Mini DisplayPort to DisplayPort Adapter-4K x 2K @ 60 Hz, Keyspan, Black, 6 in.